Building Quality Management Systems: Selecting the Right Methods and Tools explains exactly what directors, practitioners, consultants, and researchers must do to make better choices in the design, implementation, and improvement of their QMSs. BOCA RATON, Fla. - June 11, 2013 - PRLog -- Quality has quickly become one of the most important decision-making factors for consumers. And although organizations invest considerable resources into building the right quality management systems (QMSs), in many instances, the adoption of such quality improvement tools are just not enough. 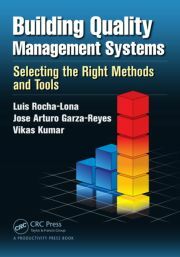 Building Quality Management Systems: Selecting the Right Methods and Tools explains exactly what directors, practitioners, consultants, and researchers must do to make better choices in the design, implementation, and improvement of their QMSs. Based on the authors’ decades of industrial experience working on business improvement projects for multinationals looking to design or improve their QMSs, the book discusses building QMSs based on two important organizational elements: needs and resources. It begins with an overview of QMSs and systems thinking and the impact of QMSs on financial performance. Illustrating the process management approach, it reviews the most well-known business and quality improvement models, methods, and tools that support a major QMS. Highlighting the importance of quality as a way of life, this book supplies the understanding you’ll need to make the right choices in the development and deployment of your QMS. With a clear focus on business performance and process management, it provides the basis for creating the quality management culture required to become a world-class organization. Dr. Luis Rocha-Lona has over 10 years of working experience in the public and private sectors. He holds a PhD in operations management from Manchester Business School at the University of Manchester in the UK, and an MSc in control systems with a major in information systems/manufacturing at the University of Sheffield, UK. Dr. Rocha-Lona graduated from the National Polytechnic Institute of Mexico as an automation control systems engineer. He has led several research projects sponsored by private companies and the Mexican government through the National Council of Science and Technology (CONACYT) and is actively involved in consulting activities to manufacturing and service organizations. Dr. Jose Arturo Garza-Reyes is a senior lecturer in operations and supply chain management at the Centre for Supply Chain Improvement, Derby Business School, the University of Derby, UK. He holds a PhD in manufacturing systems and operations management from Manchester Business School at the University of Manchester (UK), an MBA from the University of Northampton (UK), an MSc in production and quality from the Autonoma de Nuevo Leon University (Mexico), a postgraduate certificate in teaching and learning in higher education from the University of Derby (UK), and a BSc in mechanical management engineering from the Autonoma de Nuevo Leon University (Mexico). He has published a number of articles in leading international journals and conferences as well as a book about manufacturing performance measurement systems. Dr. Vikas Kumar has over six years of experience in area perations management. He holds a PhD in management studies from Exeter Business School, UK, and a bachelor of technology (first-class distinction) in metallurgy and materials engineering from the National Institute of Foundry and Forge Technology (NIFFT, Ranchi) in India. He also holds the status of associate of the Higher Education Academy (AHEA). Dr. Kumar joined Dublin City University Business School as a lecturer in management in 2009. He has previously worked as a research assistant at the University of Hong Kong. He was a visiting scholar at the Indian Institute of Management, Ranchi, in India and at Khon Kaen University, Nong Khai campus, in Thailand. He has worked on a number of consultancy projects for many multinational firms, such as BT, EDF Energy, LTSB, and Vodafone. He is also actively involved in process improvement projects in Irish hospitals.